The Reverend Iona Dickinson has been serving as Pastor at University City United Church (a United Church of Christ congregation) since June 15, 2015. She brings with her more than a decade of pastoral experience and has a love for experiential worship, small group conversation, and teaching. 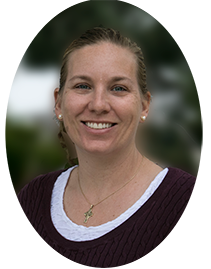 Prior to coming to University City, Iona had been serving as pastor at Delmar United Methodist Church outside of Albany, NY for nearly 5 years and Claremont United Church of Christ in southern California for 8 years. And before that, she studied Environmental Science and Religious Studies at Allegheny College and earned her Master of Divinity at the Claremont School of Theology. When she’s not at church, you will likely find Iona spending time with her family (spouse Phil and two daughters), reading, swimming, cooking, or napping (she has two small kids so this goes with the territory!). Music has been a part of Jeanne’s life since an early age. Her mother was an organist/choir director, and Jeanne began singing in church choirs while in grade school. She played clarinet from 7th to 12th grade and cherished her time in marching and concert bands. At Converse College in Spartanburg, SC, she switched to vocal studies and earned her Bachelor and Master Degrees in Music Education there. She became “hooked” on directing choirs after taking a conducting course during her studies at Converse. She began her career at UCUC with the Seraphim Singers in 1975. Her choral training/experience continued as a member of Mesa College Chorus under the direction of Dr. Richard Chagnon. Her musical horizon was greatly broadened in 1996 when she joined the La Jolla Symphony and Chorus under the direction of Dr. David Chase, who has been a mentor for her since joining that organization. Jeanne has been the choir director for UCUC for over 20 years. Michelle Gray studied Music at UCSD and is an accomplished pianist and keyboardist. She has a wide range of experience playing for church services, weddings, choirs, and parties, to name a few. She has worked with several Southern California regional theatre companies such as Moonlight Stage Productions, San Diego Musical Theatre, and Welk Resorts. In her spare time, Michelle teaches private piano and vocal coaching lessons and creates custom sound tracks in her home studio. Catherine Arias, a San Diego native, joined the staff of UCUC in November of 2015. Prior to becoming the administrative assistant here, she owned her own small business, a flowers shop, for 2 decades. After a couple of years of “retired life” she had a desire to feel more productive and “needed” and found her way to UCUC. She can typically be found in the church office helping to see that things run as smoothly as possible. Stop by and say hello… she always has a smile for everyone.